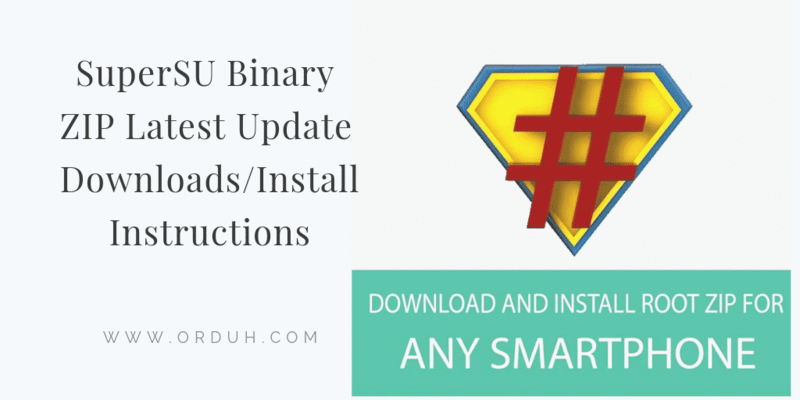 SuperSU Binary ZIP Latest Update Downloads/Installs: The SuperSU binary is a superuser manager app developed by Chainfire, which manages root permissions on rooted Android smartphones. Also, Chainfire created a recovery flashable SuperSU zip file. Furthermore, this zip file contains the SuperSU app and the binaries required for root access. In simpler terms, you can flash the SuperSU zip via a custom recovery and get root access on most Android devices. Note that if your are already rooted, installing through Play is by far the easiest way to install SuperSU! Skip to How to Flash SuperSU zip via TWRP Recovery to learn how to flash the Zip file to your Android device. Firstly, installing the SuperSu apk does not make your device rooted. The SuperSu apk is only useful if you already have root access. For unrooted devices, you have to flash it via custom recovery like TWRP or CWM. Firstly, download SuperSu via Google Play Store for free. However, you need root access to run this app. Also, you might not get the latest version on the Play Store. Additionally, SuperSu won’t work if the phone isn’t rooted already. Secondly, the SuperSu Binary Zip file is also available in a recovery flashable zip which is downloadable through the official Chainfire website. However, unlike the Play Store version, the latest version of the SuperSU is always available via their website or right here on OrDuh! Finally, although the package is a flashable zip, you can extract the files on a PC, then grab ‘Superuser.apk’ and install it on your Android phone. Tap on “Install” and select the SuperSU zip file that you transferred to your device in Step 1. Once SuperSU is flashed, you’ll get “Reboot System” option, select it. Do you know how to flash the SuperSu Zip to your Android device? No? Then, learn how to flash the SuperSu.zip file using TWRP Recovery & Root any android device. The requirements? Requirements include an unlocked Bootloader (for specific devices), a Custom Recovery installed and a minimum 50% battery life. Seep, do you know how to improve Android battery life? Read about it here! Does the auto boot patcher in V2.66 means dual boot capability and if yes, how do we use it? Glad that the SuperSu binary worked for you. Thanks! SuperSu zip works perfectly! I’m happy that the SuperSu binary works with your device. what zip I can use to perfectly can use it?